Remembering all of your passwords may not seem difficult...until you think about just how many passwords you have. One for each email account. One for each bank account. One for each shopping site. The list goes on, and on. If you want to make your life simple, you can choose the same password for every account. But if you want to keep things secure while making life simple, you need a password manager like LastPass. This free software comes in a 32-bit and a 64-bit version. 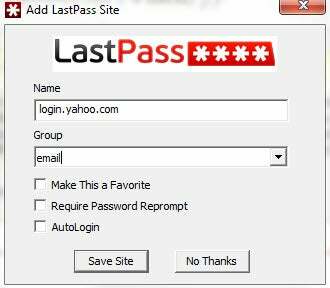 When you enter a login, LastPass asks you if you'd like to save it, and lets you categorize it.